These waveguide bandwidth detectors use silicon beam lead diodes on a planar stripline circuit to obtain an extremely rugged and compact device. Most millimeter wave broadband detectors have very poor VSWR due to the difficulty in obtaining a good wideband impedance match to the diode. To overcome this problem, these detectors utilize two diodes and an internal matched termination and 3 dB hybrid as shown below. This circuit allows a VSWR of 2.0 or better over a full waveguide bandwidth for most of these detectors. Detectors for waveguides WR-8 and smaller use a single zero bias GaAs diode. The high sensitivity zero bias GaAs diodes can also be special ordered for use at lower frequencies when highest sensitivity is required. Maxumum RF input power 100 mW. 1 Models VDH and WDH are ruggedized, gold plated detectors. * Detector sensitivity is measured into 1 Megohm load and is measured in the square law region. ** These detectors are single diode detectors using a zero bias GaAs planar doped barrier diode. Sensitivities are estimated above 140 GHz due to lack of calibrated power sensors above 140 GHz. A detector adapter (model DA) is available to match these detectors to the square law saturation characteristics of the Wiltron 560 and 562 Scalar Network Analyzers. 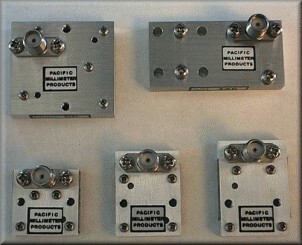 These detectors also can be used with HP 8757 scalar network analyzers utilizing HP 85025C detector adapters.